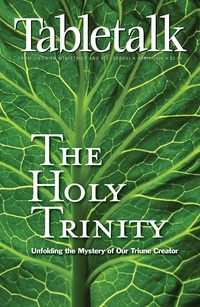 Trinity is the word utilized by Christians to signify the central doctrine of their faith — the truth that in the unity of the Godhead there are three distinct persons, the Father, the Son, and the Holy Spirit. This is the theme of the April 2006 issue of Tabletalk. Sadly, many Christians deem Trinitarian theology to be speculative and impractical. Yet the early church fathers were not preoccupied with abstractions; their concern was man’s salvation. Thus this issue of Tabletalk will serve to encourage and inform Christians of their ancient and biblical faith in the triune God of redemption. Contributors include R.C. Sproul along with Don Kistler, Robert Letham, Nick Needham, R.C. Sproul Jr., Allen Vander Pol, and Gene Edward Veith. Tabletalk features articles about topics central to the Christian faith and daily, in-depth Bible studies.